The ‘uniform’ of many dog groomers is made with a tightly woven nylon fabric that keeps tickly, or irritating, dog hair from reaching places it shouldn’t! Nylon is practical, comfortable, hard-wearing and easy to wash-which, when working with animals, is much more important than fashion statements. 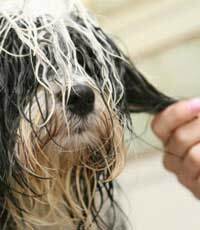 When a dog has been bathed, the first stage of drying is done with a high velocity dryer for larger dogs (nicknamed ‘the blaster’) so the animal is not dripping wet at any stage.Secondly, the squeaky-clean pet is towel dried around more sensitive areas-like the face and tail. Dryers are never used on these areas. The third-and final-drying stage takes place when the dog is secure on the grooming table. A stand dryer, on wheels, is suitably positioned for use on each dog-as Chris brushes the pet’s coat. Unruly dogs, human error, people holding scissors-potentially a combination for things to go wrong. Styling requires good concentration. The slightest twitch or sudden movement can result in a nick to the animal-so it is important to remain focused on the job in hand. It’s hard to recognise Harvey, a Shih-Tzu that arrived two hours ago looking like a demented gremlin. He trots out with the confident air of a dog that knows he looks the business.